Fabulous Facial Mist is gorgeous rehydrating facial mist, designed to give your spirits a lift and your face a dewy, restorative glow. Rose Otto Pure Essential Oil (Rosa Damascena) - A richly moisturising oil distilled from rose petals. 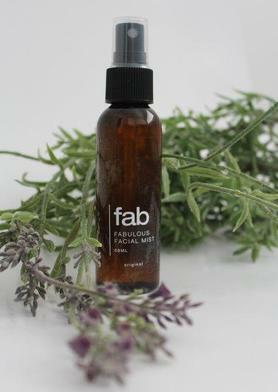 Hand made in Mermaid Beach, using only the highest quality ingredients, Fabulous Facial Mist is a wonderful treat for yourself, or a thoughtful gift for someone you care for. "I recently took 'fab' with me on an overseas holiday. It was a great refresher in the middle of the day when you felt like freshening up a little without much fuss. On the face and on the chest, the natural ingredients really reset us for the rest of the day. A highly recommended travel companion for men and women!"